For those of us who celebrate Hanukkah, we will soon experience the once in a lifetime convergence of the Thanksgiving and Hanukkah holidays. We’ve been thinking about creative ways to combine our Thanksgiving and Hanukkah traditions, while looking over ideas published in honor of this unique Thanksgivukkah opportunity, such as this quick guide from ReformJudaism.org and this Wall Street Journal article. Here are our ideas and tips, we’d love to hear about your Thanksgivukkah plans in the comments. But first check out this fun “Ballad of Thanksgivukkah” music video from Rabbi David Paskin. Prioritize What Is Most Important to You: What are the most important meanings and traditions your family loves to celebrate from each holiday? What are the messages and fun highlights you want your children to experience? I always like to start with this because the rest will flow easier when I’ve thought through the big picture. This also saves time and keeps things reasonable given our busy realities. Have fun, don’t do the double the work just because two holidays coincide. Deeper Meaning and Ritual: We take turns sharing what we are thankful for as part of our Thanksgiving tradition, while for Hanukkah we talk about the story of the Maccabees with themes of freedom, miracles, and courage. So this year I will combine these in our discussion and storytelling. For example, we can talk about what a miracle or courage means to us and examples that we are thankful for. When my sons were little we read from age appropriate books starting with the lift the flap and pop up types. I also like to play some spirited Hanukkah music to help set the mood. This year our Thanksgiving table will feature the traditional Hanukkah menorahs and dreidels along with the usual Turkey Day trimmings. Activities and Decorations: Both holidays have always been easy foil for fun arts and craft projects with the kids. Stand bys for Thanksgiving are as simple as paper napkin holder decorations (construction paper cut as a ring taped together with perhaps some colorful leaves as decoration), or a paper plate or construction paper circle with the added head and legs to make their own turkey. 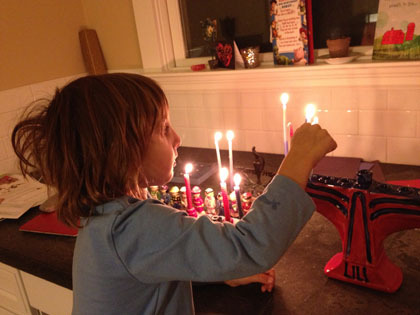 My sons have made fun menorahs and dreidels in many different formats over the years. Pinterest and sites like reformjudaism.org are great sources for ideas and information. The Food: From turkey, cranberry sauce, and pumpkin pie for Thanksgiving to latkas and doughnuts for Hannukah, we love the food of both holidays. Since Wednesday, November 28 is the first night of Hannukah we can celebrate with the traditional Hannukah fare that night followed by delicious Thanksgiving dishes on Thursday. My family tend to be purists not wanting to mix up their food traditions too much, but we’ve seen some creative recipes designed for this holiday collision such as the discussion in this New York Times article and the creative results of this friendly competition between the Food52 and Serious Eats blogs (a little labor intensive for my busy Mom life but looks delicious!). In our case, we will pick our favorite foods for each holiday and just plan when we’ll have each but I applaud the creativity of these Thanksgivukkah inventions! An example of a Pinterest board with Thanksgivukkah food, decoration, and articles is http://www.pinterest.com/urj/thanksgivukkah-a-once-in-a-lifetime-holiday. Gifts: For Hanukkah, we have always given eight nights of gifts starting with a small pouch of chocolate coins and tradition of playing dreidel (a spinning top) game the first night, until giving the larger gifts in the last few nights. In between are small inexpensive gifts like a paperback book or kaleidoscope. The fun is building the anticipation and looking forward to the mystery of what each evening’s gift will bring. As my sons grew older we added a tradition of making one of the nights a donation to the cause they each choose instead of getting a gift themselves. This draws out interesting discussion about what causes they care most about and how we might help as a family. What are you planning for your Thanksgivukkah celebration? Wishing all a wonderful, fun holiday!